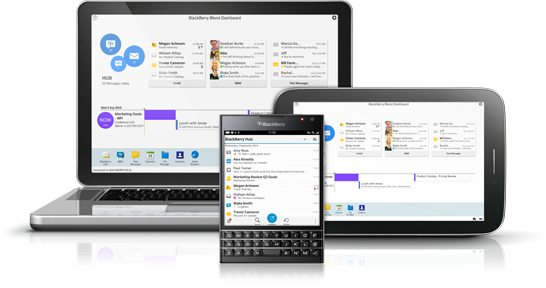 BlackBerry Blend brings all your BBM and text messages from your BlackBerry to the integrated messaging hub on your computer and tablet. Get instant notifications of new messages, and read, respond and create messages on any device to be more productive. Forgot your BlackBerry smartphone at home? You can still get your BBM messages, emails and text messages from your BlackBerry on your computer or tablet through BlackBerry Blend, even when you don’t have your phone with you. Because the power of BlackBerry is extended to your computer and tablet through BlackBerry Blend, you have secure access to your work email, calendar and important files on any device without VPN. So much easier, so much faster. BlackBerry Blend can connect wirelessly via Wi-Fi or cellular connection, or wired through the USB port on your computer. Once connected, use your BlackBerry ID on your computer and tablet to connect to BlackBerry Blend and you are set to go. BlackBerry Blend is easy to set up. Simply download and install the software for your computer (Mac and Windows) or tablet (Android and iOS) and then log in with your BlackBerry ID. The BlackBerry Blend app is already installed on BlackBerry smartphones running BlackBerry 10 OS version 10.3 or later. It still irritates me that BlackBerry killed off BlackBerry Blend. In my opinion, the app was a bit ahead of its time and to help highlight that, one only has to look at Microsoft's new "Your Phone" announced at Build. Should BlackBerry revive BlackBerry Blend and bring it to Android phones? For those of you out there who had the pleasure of using Blend, would you like to see it brought to Android-based BlackBerry smartphones or is it one of those things that's better left in the past? If you're a fan of BlackBerry Blend, BlackBerry has quietly posted some disappointing news. According to their software lifecycle page, BlackBerry Blend as of July 31, 2016, has reached end of life status and will no longer be supported officially. If you love BlackBerry Blend as much as I do, you're going to want to stop for a minute and fire up BlackBerry World. A new BlackBerry Blend app update has now arrived in BlackBerry World and is available for download.